This is just a quick post to say that poetjohndavisjr.com has almost reached 200 followers! If I can pass the 200 follower mark by Friday, I will offer all of my blog followers free Kindle copies of my first book. The second collection is currently under consideration and should find a home soon. 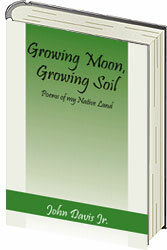 For now, spread the word about my site, and you can get a free Kindle copy of Growing Moon, Growing Soil!